This piece of plaster was part of the decorative scheme painted by an unknown artist for William Sparrow (1601-1651) at Park Farm, Hilton, Huntingdonshire. The owners of Park Farm were prosperous yeoman farmers. The decoration was done by an artist of moderate ability, who would have been more affordable than fashionable London-based artists from The Netherlands. This scheme was probably carried out in anticipation of William Sparrow's marriage to Susannah Christian of Fenstaton, Huntingdonshire in 1633. This is a rare example of dated English wall painting of the period. Houses owned by the gentry and merchants were often decorated with murals during the 16th and 17th centuries, mostly in imitation of wall hangings. However, few figurative paintings of this middling quality survive. They were not considered worth preserving and were often overpainted, or even destroyed, during subsequent redecoration. The images of Taste and Sight were adapted from Jan Barra's series The Five Senses, published about 1625. The figure on the left , holding a glass of wine and a pipe, represents Taste. The figure on the right, holding a mirror, with an eagle at her side, represents Sight. Jan Barra was a German engraver who settled in London in 1627 and died there in 1634. His work was sold at the shop of Thomas Jenner at the Exchange, London, and probably also in other towns and cities in England. The prints would therefore have been easily available to the artist at Hilton. Based on prints designed by J. Barra of 'The Five Senses' (published about 1625)Painted by an unidentified artist for William Sparrow of Park Farm, Hilton, Huntingdonshire (1601-1651). The panels were removed from a wall in Park Farm, Hilton, Huntingdonshire in 1946 by V & A carpenters at the request of Mr Garnett, who purchased Park Farm with the hope of saving it from ruin. 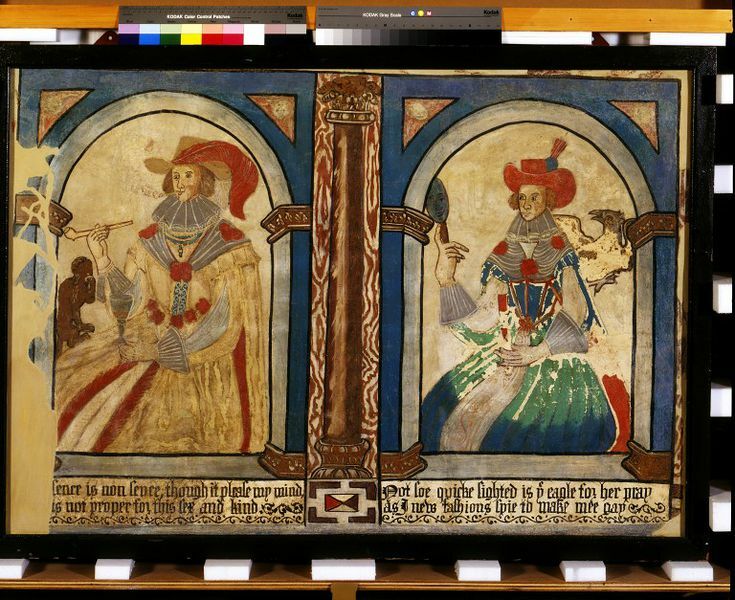 reports the discovery of painted chambers from the early 17th century. 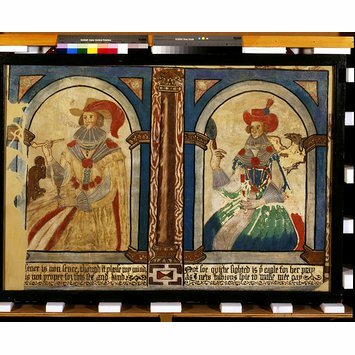 This includes the Prince of Wales feathers dated 1632 (W.29-1946) painted on plaster on Norfolk reed in an "upstairs" room and a room "downstairs" with "three figures and the remains of a fourth". She describes the figures, some inscriptions and the condition of the room. As the house is near collapse, she suggests that the V & A might be interested in the paintings. explains that two of the three figures are of Mary Frith, the heroine of Dekker's 1611 play, Bearing Girl. relates to the removal of the plaster panels and arrangements to have the V & A mount and return 4 panels to Garnett. One coat of arms to be hung in the village church. reports that the woman in the paintings is also represented in an engraving of Moll Culpurse (aka Mary Firth) at the National Portrait Gallery. relate to the proposed display of these objects. queries him re the identity of the woman playing the lute and repeats his view that the other two are Moll Cutpurse. "We identified the one with the eagle - from the catalogue of engravings at Stowe". He reports that the room they came from had originally been panelled in oak half way up and the paintings were above.